As I said in the former post, I have tried all kind of ways to attach the stars to the background and at times thought I just chuck it and glue the danged pieces in their place. I know, that won’t work either and after trying this and that I think that I have come to the conclusion that a narrow zick-zack (not too narrow though) with YLI silk thread will work the best I have one problem, since the stars have such sharp points, the fabric easily fray and some strands of thread shows between the stitches. Maybe I ought to get some fray check? I hava tried satin machine stitch: but since the stars is rather small, the stitches build up quite ugly (the beige ones). Have to think about this some more. Isn’t it gorgeous? I have a pestle and mortar that is in this design area. Got a note from Amazon.UK on Friday that it has been shipped – yay. Fuse the stars down first. 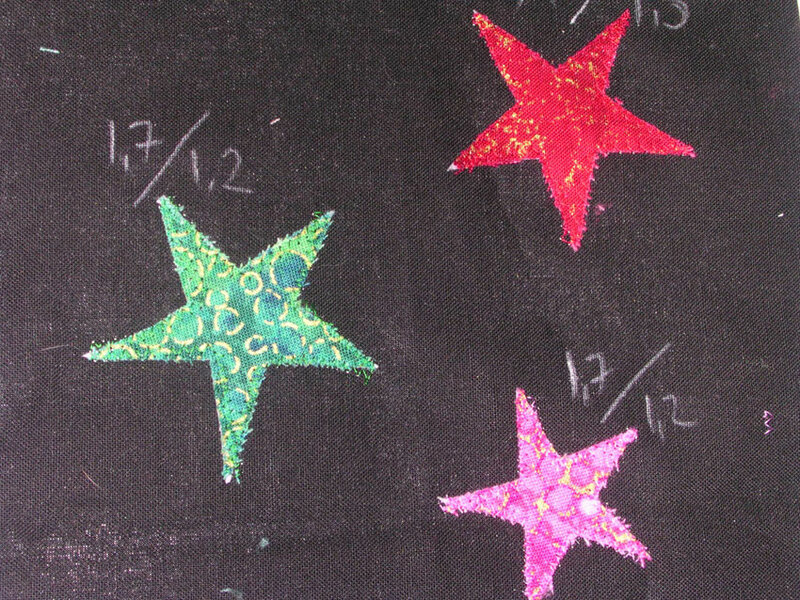 The glue from the fusible…helps keep the stars from fraying. Steam-A-Seam do a tacky version that I have used before that I did not have a problem with fraying although I now use a German product that’s not tacky. Are you making sure it is ironed down properly before you start to sew? Also another option if the problem is happening when you remove the paper from the cut out fused star is to apply the fuse webbing to the fabric before cutting out your star. You can then draw/trace the star shape you want on to the removed backing paper in pencil and iron it back on to the fused side of the uncut fabric, pencil side down (make sure you don’t accidentally let the iron touch uncovered fuse webbing), allow to cool and remove the backing paper again. It will leave a pencil tracing for you to use as a guide to cutting out the star resulting in not having to pull the paper away from a cut star point before placing it on your quilt top to iron down. Oh gosh you are not selling Appli-Kay to me 🙂 Steam-A-Seam do a version that is sticky on one side exactly like Appli-Kay so you can reposition it before ironing down or a version that is tacky on both sides (has paper on both sides) so you don’t even iron it first on the applique fabric so you can remove the webbing from the applique fabric if you change your mind about your choice of fabric before its ironed. Used both and never had a problem getting the paper off even the most pointed pieces. If anything my only bug bare with it (other than the price) was that you had to be careful the paper does not just fall off before you have cut out the design. I now use so much fuse webbing that I am using a cheaper none tacky type. Also sounds like the webbing is very soft if it is allowing your point to roll over on themselves. Not a problem I have ever experienced. I have watched a video of Appli-Kay and it does not show a problem with removing the paper or that points are rolling over so I am wondering if the stuff you have is faulty or maybe on the old side or not ironed on to your applique fabric well enough before you remove the paper (make sure it is cold before you remove the paper). Sounds like your only option with the webbing you have is to cut out the shape after you have applied the webbing and removed the paper. With the hope it does not stick to the scissors as you cut out your stars. I don’t know anything about fuse webbing, just came across Appli-Kay when I was making the Butterfly Gargen and thought it worked well. Then. No pointy stars at that time. But it is kind of thick and in this case, hard to remover the paper. On the photo of the three starts what is the white visible at the point tips? Sadly – yes. The very pointy fabric bits tend to kind of roll over and glue themselves double…Have to be very careful when I go live.